The transport company Johs Rasmussen, Svebølle is one of Denmarks larger haulage contractors with divisions and filials all over the country and a daughter company in Flensburg Germany. Our main office is placed in Svebølle. The company has about 200 emploees. A affiliated company of 40 employees attached to the transport company manage maintenance, cleaning and service of the company’s equipment. If you want to know more about the transport company Johs Rasmussen, Svebølle A/S please contact us. 1932 Johannes Rasmussen started as a haulage contractor in Svebølle. The first transports were the milk-run to Copenhagen with return-goods for the local grocer’s shop . Soon other grocers heard about the possibility to get fresh supplies from Copenhagen, and then the foundation for the transport company was laid. The first tank-truck was bought. The company was registrated as Johs Rasmussen Svebølle A/S. Second generation, Per W. Rasmussen took up as executive manager. At this point the company had 27 trucks and 40 employees. The Ruth and Johannes Rasmussen Foundation, which owns the company 100% was established. JR celebrated its 40th anniversary. At this time it was grown to 43 trucks and 50-60 employees. The division in Kolding was established. JR’s system of quality-management was certified according to DS/ISO 9002. In December an evaluation was passed according to SQAS (safety- and quality assessment system compiled by the European chemical Industry Council (CEFIC)). E. Steffensen Viby Sj. A/S. is incorporated May 1st. The Tank transport section of the company Hellestrup is incorporated January 18th. September 1st 3rd generation Klaus W. Rasmussen assumes management from his father Per W. Rasmussen, who simultaneously becomes manager of Johs Rasmussen Svebølle A/S Holding. JR takes over all trucks from Aalborg Portland on Sjælland and with that all Sjælland cement-haulage. March 1st the company celebrates its 75th anniversary. September 15th JR takes over the Lubricants business from Samat Nordic in Sweden. We prepare the way for your business. We wish to be the leading tank-haulage contractor in Scandinavia and the leading contractor for transporting concrete panels in Denmark. 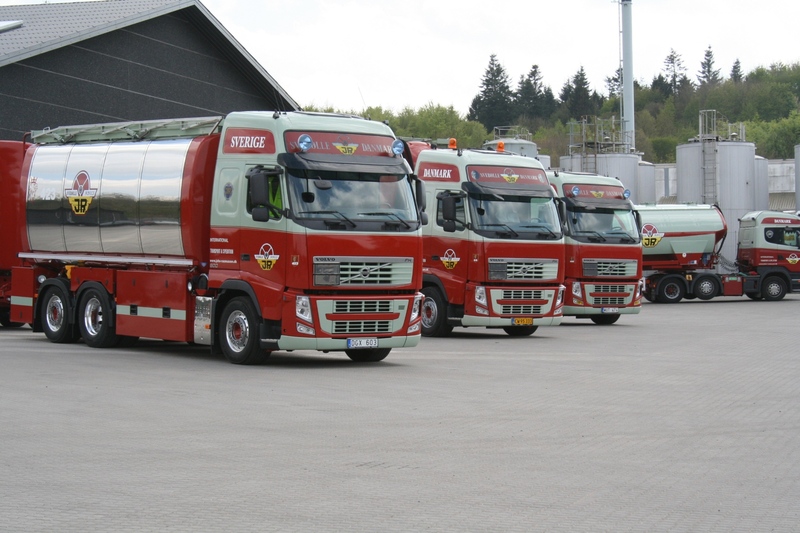 We offer tank-haulage, transport of concrete panels and Platform truck-transport for companies in Scandinavia. We want to know our costumers needs and to create innovative solutions for bettering the competitive power of our costumer and ourselves. We are serious, trustworthy and show responsibility. We are proactive and show constant care. We are innovative and open for new ideas. We are open and welcomed new colleagues. We speak politely and show confidence. We are ready to make a difference. We are going to earn a bit more every day. We are going to be a bit more capable every day. As a superior philosophy Johs Rasmussen, Svebølle A/S has, that two parts are required for a good business act. Therefore the company wish to create long-term relationships for making added value for the company and its costumers – and simultaneously contribute positively to local and national development. We wish to be a competent sparring partner. Interacting with the management and across fields of skill the mission of the Division of Economy is to contribute to JR being run as effectively and economical as possible according to the strategic priorities. Provide the interest groups of the company with sufficient economical information for any relevant decision-making process. Form a general view over the economical result on varying levels of aggregation. Develop the economical function for creation of assets and functioning as internal consultant. Assure that legal demands and possibilities are met and actively employed. We want to be an attractive employment. We will try to hold on to our present co-workers by presenting the company’s strategy and policy, so that all employees will know the importance of their function in the company. We will attempt attracting persons of first-rate ability by holding on to a dynamic and a spirit affecting all links outward and by promoting the message of JR being an attractive company. We will try to assure that the employees at all times improves for the benefit of the company and their own choice of career. We will attempt with optimal conditions to contribute to the performance of the employees task by technological and educational measures. To live up to the costumer’s demands and expectations. To assure correct delivery (delivery at the specified time and place). To minimize the amount of damages. To assure optimal use of materiel and resources. To implement correct invoicing (one invoice per costumer per consignment). To assure on time invoicing. To comply with all relevant standards of safety in the trade, hereby certification, according to SQAS ROAD & Tank Cleaning. To comply with all demands according to GMP+ Standard B 4.1 inside feedstuff-safety and to maintain a suitable HACCP-system. To minimize occupational risk and accidents. To work for a continuing improvement of the physical and mental work-environment. To assure that all driving diagrams/data are collected on time. To assure optimal utilisation of fuel. To consider issues of environment when buying (rolling) materiel. To aim at a high degree of utilisation by minimizing distances driven. Precision is and will always stay an important parameter of quality. Therefore it is the objective of JR to respect terms agreed with the costumer for any given transport. Likewise it is important that the goods aren’t damaged or reduced in quality in transport. It is our objective to provide a high quality of transport any time suited to the demands and requirements of the costumers. The quality of delivered services must as a minimum comply with all demands according to law and public statutes. Also the equipment must be of a quality, so that we always are capable of accomplishing the task, we have undertaken from our customers. The safety and health of the employees. Safety and health of anyone influenced by our activities. Protection of our own equipment as well as others. See control statements of the Department of Nutrition here. Download our STANDARD TERMS here. The contents of this website are subject to the laws of intellectual property and interational treaties. Sharing of this website may not, without prior permission from Johs. Rasmussen, Svebølle A/S, be reproduced in any form or with any method.